The 10 hole diatonic harmonica is probably the most widely recognised type of harmonica, with the most number of players worldwide. While the chromatic harmonica enables a player to move up and down a scale in half steps using a slide, a diatonic harmonica is tuned in a different way. The diatonic harmonica uses a selection of notes rather like the white keys on a piano. The central four holes provide the melody notes of the major scale – do-re-mi-fa-so-la-ti-do – just like a 4 hole diatonic, while the lower holes provide a chord accompaniment. The upper notes are an extension of the central melody notes, giving the 10 hole diatonic a range of three full octaves. Technically speaking, all harmonicas that are not chromatically tuned are forms of diatonic harmonica. To differentiate however, the 10 hole diatonic is sometimes called the Richter tuned diatonic harmonica, after the German who first invented its special reed configuration. 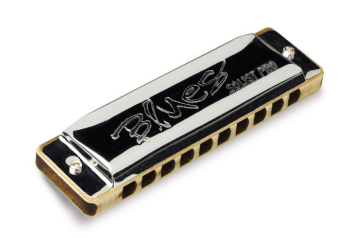 Other names for the 10 hole diatonic harmonica include the short harp, blues harp or just the harp. You can also find 4 hole, 6 hole, 12 hole and 14 hole Richter tuned diatonic harmonicas. As a non-chromatic instrument, the diatonic harmonica comes in twelve different major keys, as well as harmonic minor, melodic minor, melodic major, Celtic, Spanish and special tunings. 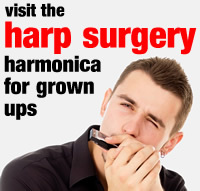 Other tunings are developed from time to time, and you can even order your own customised diatonic harmonicas. The diatonic has one more unique feature; a spin-off from its special reed arrangement. By using your tongue in an inward sucking or outward whistling type movement, you can alter the air-pressure inside the harmonica, making certain reeds bend. This produces that delicious bluesy sound.